If you’re worried about keeping warm and cozy these next few months, look no further than our video on how to button up your home for the cold season and cut your utility bills while you’re at it! 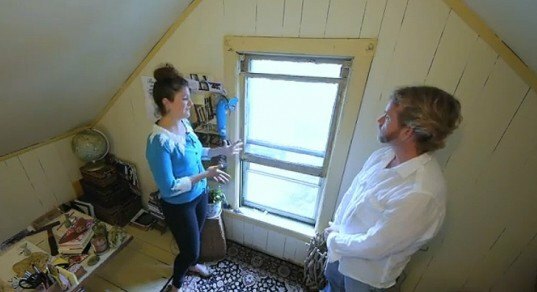 We’ve enlisted the help of green energy expert Steve Schappert to take eco-fashion blogger and author Starre Vartan through a home energy audit and winter weatherization home makeover. Watch the video above to find out where Starre’s home was lacking when it came to energy efficiency, and learn how you can pinpoint and remedy similar problems in your own home. Jill Fehrenbacher: The planet may be heating up and we may have had the hottest summer on record yet, but that doesn’t mean the winters are getting any warmer. We all want to stay warm and cozy in our homes during the winter and do so in a way that won’t break the bank, but so many people are wasting so much money and energy with old inefficient heating systems and houses that are poorly insulated and leaky. I’m Jill Fehrenbacher from Inhabitat.com, and today I’m going to show you how to get your home all buttoned up and ready for the winter by taking eco fashion blogger and author, Starre Vartan, through a home energy audit and winter weatherization home makeover. Let’s go get started. Starre Vartan: Hi Jill, welcome to my home. Jill Fehrenbacher: Good to see you. This is Starre — she’s the editor and founder of Eco-chick.com. So Starre, let’s talk about what we’re going to do with your house today. Starre Vartan: So over the last seven years writing my blog, I’ve learned so much about how to make a house green and eco-friendly, but what I haven’t really focused on is energy efficiency. I feel like that takes a real expert, and so I’m excited to hear what an expert has to say about it. Jill Fehrenbacher: So the first thing that you need to do is to get a professional home energy audit or otherwise inspect your house. So I brought a home energy expert here today for you. His name is Steve Schappert. 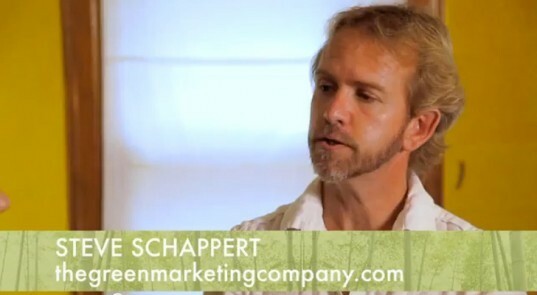 Steve Schappert: Hi Starre, nice to meet you. So what we want to do today is actually show people how to qualify a home for a home energy audit. Starre Vartan: Great, so where do we start? Steve Schappert: Right downstairs in the basement. So when scheduling an energy audit, we try to keep it very simple. We need your name, your address, contact information, and whether you have asbestos-like material in your home. As an example, that would be right here. Kind of looks like a cast. As long as it’s sitting there and it’s not friable, it’s usually not hurting anybody. But if we put a blower door on the front of the house, all the dust in the basement then gets pulled up into the living area. So we’re not gonna be able to do a blower door here or a typical energy audit, but we can walk you through the house and show you how you as a homeowner can improve the weatherization of the home. The energy audit starts with safety first, so what the crew is going to do is they’ll come down and check all the gas lines to make sure we don’t have any gas leaks. They’ll then test the carbon monoxide in the draft so that you’re not getting toxic gases back down into the house, but the most important thing to do is check the filter on a regular basis. Try doing it every month during the heating season. Starre Vartan: What should I look for? Steve Schappert: Dirt. It’s that simple. Okay Starre, this is one of the tools of the trade. It’s a thermal imaging gun, and it’s going to help us determine where the heat loss is in the house. The lighter colors are warm, and the darker colors are cool. And as we look around the house, we can determine where the heat is escaping and be able to go inside and address it. Now the energy audit industry is still relatively new, but we have some old friends that have been around millions of years that are much better experts than we are. Spiders. So anywhere in your house where you see a cobweb it’s usually there because you have an air leak. Starre Vartan: So no fancy equipment needed? Steve Schappert: Not necessarily, no. They have much more experience than we do. Starre Vartan: That’s amazing. Who knew? Steve Schappert: Now we’re going to get in and actually do some sealing, and you should always wear hand protection and eye protection. This is expandable foam. What we’re going to do is just spray it around the windows and seal up all the cracks and crevices. Starre Vartan: It looks like whip cream. Steve Schappert: Doesn’t taste anywhere near as good. Starre Vartan: This is my bedroom. I live in my attic, and it gets very, very chilly in here during the winter. Steve Schappert: I’m looking over your shoulder and I’ve got to ask the obvious question, what’s going on over there? Starre Vartan: It’s a crawl space; it’s a storage area. Steve Schappert: We can either build the door, or for now you could just take some rigid insulation and put it in place there. It’s a very quick fix, cost you 20 bucks, but it’s going to make a giant difference in how comfortable you are in the room. Starre Vartan: Awesome. So I wanted to show you this window Steve because it’s the bane of my existence. It’s so cold in the winter. What can I do? I can’t afford to replace it. I’ve looked into it and it’s really expensive. Steve Schappert: Well the good news is that the glass is intact, so when you’re sitting here and you’re feeling the drafts, it’s not because it’s coming through the glass. Where you’re getting the drafts is around the edges. We can just caulk this. 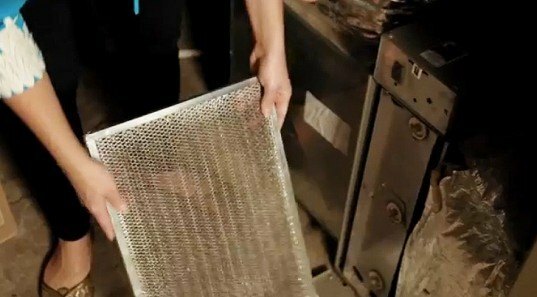 The last thing we’re going to do is we’re going to install one of these cellular shades. You can see how thick that is. That air pocket in between is providing insulation. You’re going to be much more comfortable, and it looks great. Starre Vartan: It looks awesome, and I love how there’s no cords to trip over or for the cat to play with and pull the thing down. Steve Schappert: That pretty much finishes up the day. We started down in the basement, we filled up gaps, we went over the furnace, sealed up windows, weather strips, we put the blinds in. In total I think we spent about $80 for the day, and that’s just going to make a dramatic difference in how comfortable you are in the house. Starre Vartan: Thank you so much Steve. I really appreciate it. Steve Schappert: You’re very welcome. Enjoy it. Jill Fehrenbacher: So we’ve gone through the whole house and done kind of all the heavy lifting of sealing up all the gaps and cracks, so the last thing I would ask you, which is really really important, I think it’s crucial that you get a programmable thermostat. Do you have one? Starre Vartan: Yes. I got a new programmable thermostat, and I love it. It goes on automatically before I wake up, so I’m not running around the house freezing. And in the evening when I come home from work, it’s ready to go and my house is warm, but it’s cool all day long, not wasting energy. I think it’s like the greatest invention ever. Jill Fehrenbacher: Well it sounds like you’re all set then. Starre Vartan: This has been such a cool experience. Thank you so much for showing me all these tips and tricks. There is one important remark to be added. When you winter-proof your home, it works as a potential price increase for the future sale of it. Also for the previous history of the house, it is very good that it was well prepared. Homes that are energy efficient, which also means that they have good isolation, plastic double windows, and other materials that help to maintain the temperature, sell very well on the market. I never thought of inspecting the basement for asbestos before having an enrgy audit, since it would pull the asbestos upstairs to your living quarters. It's great to see how easy these fixes are - I'm going to try out a few myself! learned a lot from this video. especially about window gaps and spiders, of all things! This is a great video! I had no idea about the spiders! The bit about the spiders was really interesting! I had no idea! If you're worried about keeping warm and cozy these next few months, look no further than our video on how to button up your home for the cold season and cut your utility bills while you're at it! We've enlisted the help of green energy expert Steve Schappert to take eco-fashion blogger and author Starre Vartan through a home energy audit and winter weatherization home makeover. Watch the video above to find out where Starre's home was lacking when it came to energy efficiency, and learn how you can pinpoint and remedy similar problems in your own home.